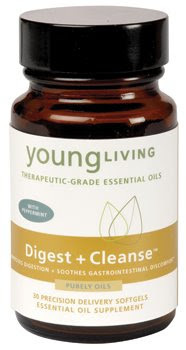 Digest + cleanse, which soothes gastrointestinal discomfort and supports healthy digestion* ( 30 softgels ). Young Living’s Balance Complete is an energizing, superfood shake high in a Young Living proprietary fiber blend called V-Fiber™. Research from the Life Extension Foundation shows that fiber blends produce more viscosity (thickness and absorption) and are more effective than one type of fiber alone. Young Living’s cutting-edge blend of soluble and insoluble fiber (11 grams per serving) is ideal for cleansing, weight-loss, and everyday health maintenance. Digest + Cleanse is a totally unique Purely Oils product. It supplies therapeutic-grade peppermint, caraway, lemon, and other essential oils directly to the intestine with Precision Delivery softgel capsules. Research shows that enteric-coated peppermint is effective for gastrointestinal upset. A blend of peppermint and caraway oil, taken three times daily, is shown to reduce gas and soothe the intestinal tract. Lemon oil, another key ingredient in Digest + Cleanse, has an equally long history. Jean Valnet, famous medical doctor and practitioner of aromatherapy, says lemon oil stimulates gastrohepatic and pancreatic secretions. Other supportive oils in Digest + Cleanse—ginger, fennel, and anise—have a long tradition of cleansing and improving digestive function. They are reported to soothe the bowel, improve elimination, and activate various digestive organs. *Take one capsule 30-60 minutes before each Balance Complete shake to greatly increase the effectiveness and comfort of the 5-Day Nutritive Cleanse. NingXia Red’s reputation as a powerful, natural antioxidant and nutrient dense infusion is unmatched. NingXia Red provides dynamic and sustainable energy, making it ideal for maintaining energy while cleansing. There are two distinct phases in the cleansing process. In phase one, toxins are broken down and made water soluble. Phase two removes these toxins from the body. NingXia Red provides essential nutrients that enhance both phases of detoxification. NingXia Red is loaded with nutrients that nourish and support pancreatic and liver function. Like Balance Complete, NingXia Red contains constituents that may help maintain normal blood sugar levels. It is high in vitamins, minerals, amino acids, flavonoids, carotenoids, cerebrosides, pyrolles, and zeaxanthin. Easy to digest, delicious to the taste, and with a glycemic index of only eleven, NingXia Red is an ideal part of any cleansing program. *Note: The 5 - Day Nutritive Cleanse is a starting place. More intense and targeted nutrients may be required for your particular situation.